SPIKE™ treats have been known to induce lip quivering, bum shaking, uncontrollable drooling, tail-chasing and other unpredictable, unexpected and endearing behaviours such as high-fiving, belly-baring, paw swipes, head-bops, and assorted yipping and yelping due to their unusually high content of premium quality meat proteins, anti-oxidants and “superfoods” like chia, pomegranate and kale, all lovingly prepared by your friends at Petcurean, who promise you that SPIKE™ contains only all natural ingredients, with zero by-products, added growth hormones, artificial preservatives, flavors or colors. Whew. Who wants a treat? BilJac Picky No More Dog Food. 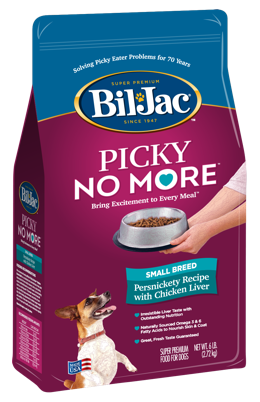 Now, we’ve taken our great taste to a whole new level to please even the pickiest of dogs. We’ve created a food that gives your dog the Chicken Liver they love in a high-quality dog food. 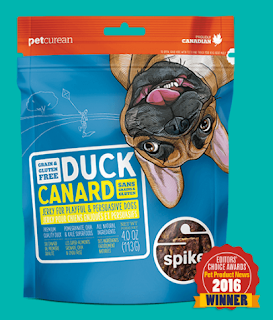 Dogs get so excited about the delicious taste of Chicken Liver in our treats, now they can get excited about dinner time as well. 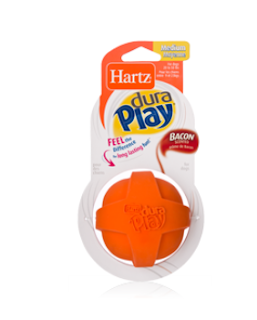 Hartz Dog Toys: Our Dura Play® brand is made even more fun and interactive with the Tug of Fun® line extension of toys. The dumbbell’s tough latex shell and foam filling make for a desirable chew, while the sturdy rope running through the toy offers enjoyable hours of tugging and tossing. The Dumbbell design allows dogs to easily grasp the toy in their mouths. 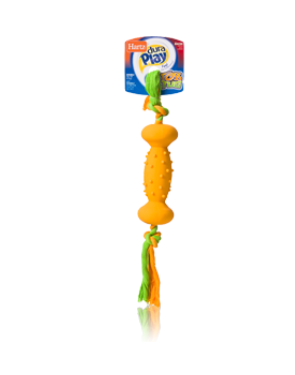 The rope that runs through the toy makes it extra durable for extended hours of toss and retrieve play! The toy is bacon-scented, too. 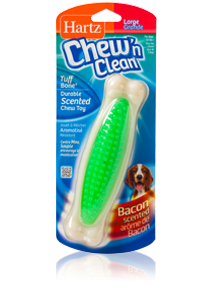 Hartz Chew'n Clean Chew Toy: This patented bone design entices chewing, which helps clean your dog’s teeth and gums, and remove harmful tartar. The toy is safe and long-lasting with an enticing bacon scent. Available in a variety of sizes to suit every dog’s needs. The Crazy Curly Chew Beef Bully Stick from Bravo Pet Foods is made from premium quality beef pizzle and are 100% all-natural. They help keep pet's teeth clean and promotes healthy teeth and gums. These chews have no added preservatives, flavors or colors and are made in the USA. 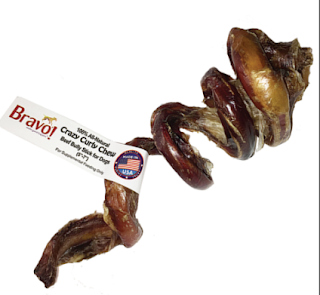 Bravo Crazy Curly Beef Bully Sticks Bully Sticks provide a long-lasting, satisfying chew. Bravo Pet Foods source and select them themselves to ensure quality, size, and freshness. Crazy Curly Beef Bully Sticks are available in one size, a 5"- 7" chew. They are tested for food safety before shipping. The Eazee by Foolee Click & Brush de-shedding tool for dogs and cats is a safer, gentler and more stylish grooming alternative. Unlike ordinary metal de-shedding tools, the Eazee by Foolee Click & Brush features a composite plastic comb with smooth, rounded teeth. The head and contoured handle are precisely balanced and users can adjust the de-shedding comb depth for either short or long hair by simply sliding a button. Plus, the handle on the Click & Brush system accommodates the company’s variety of accessories to fit any grooming need. On the hunt for a suitable, sturdy, and stylish collar for your pup? Help your pooch’s personality pop with the durable designs from Dog Collar World! 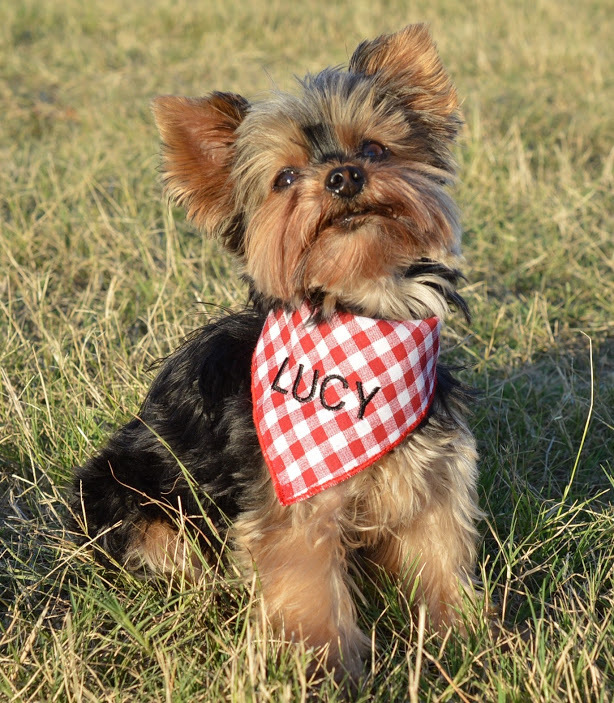 Whether your furry best friend is a Chihuahua or a German Shepard, Dog Collar World offers on trend prints and patterns that aren’t just colorful – they ensure your dog’s safety. Does Fido like to get out? Add an extra measure of safety with your phone number sewn directly on the collar – it will never fall off. If your fluffy family member gets lost, someone can easily and quickly reach you! 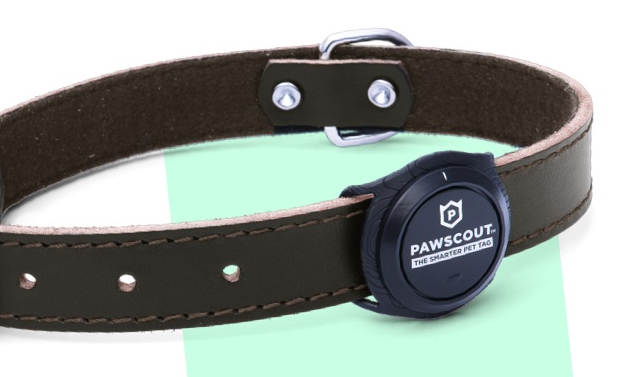 Pawscout is making it easier than ever for pet-parents to create safe communities with the NEW Smarter Pet Tag™. I put my Pawscout on my little min-pin "Mango" and I am so glad I did. I feel so much safer knowing that for under $20 I have the ability to track her if she were to get lost. In my opinion, this is the best gift you can give your pet. This modern-day name tag gives owners access to pets’ medical records and alerts. With a custom app that serves as a companion to the tag, owners can track their pet’s location, find pet-friendly places, set a virtual leash and notify friends and other pet owners if their pet gets lost. Switch to Sprint and get ONE YEAR FOR FREE!